‘Hezbollah, Russia and the US help Syria retake Palmyra,” is how the Washington Post headlined their 2 March report on the repeat taking of the historic city by allies of Assad. Russia along with other foreign forces had first driven the ISIS terrorist organisation from Palmyra in March 2016, but lost control again in December as Russia, Hezbollah, and the Assad regime focused on defeating Syrian opposition forces in eastern Aleppo city. This year’s retaking of Palmyra was supported by the Lebanese Shiite militia Hezbollah, also a proscribed terrorist organisation, and by Russian airstrikes. As for the US role, the Washington Post reports that the US carried out 45 airstrikes against ISIS targets in Palmyra in February, 23 of them in the last ten days of the month. The UK also took part in coalition action in Palmyra with an RAF Tornado hitting an ISIS-operated tank with a Brimstone missile on 27 February. At the same time in northern Syria, Assad regime forces were taking territory from ISIS along a line to block the advance of the joint Turkish and Free Syrian Army Euphrates Shield operation. Since August, Turkish and FSA forces have pushed ISIS away from Turkey’s border between the Euphrates river and Azaz, and have advanced south to al-Bab. The Euphrates Shield operation has had the dual purpose of combating ISIS and of preventing YPG militias joining together areas under their control. Having driven ISIS out of al-Bab, Turkish and FSA leaders announced they would move against YPG forces in Manbij, between al-Bab and the Euphrates river. The Kurdish YPG are the military wing of the Democratic Union Party (PYD), linked to the PKK, a proscribed terrorist organisation in Turkey. The YPG is the dominant force in the Syrian Democratic Forces (SDF), the coalition of militias backed by the US Department of Defense’s train and equip programme. The UK’s Ministry of Defence contributes training to the programme. The counter operation by the Assad regime, cutting a line across south of al-Bab to YPG/SDF-controlled territory around Manbij, serves to limit the advance of Euphrates Shield and to connect all YPG/SDF territory to Assad regime areas. With this link in place by the end of February, the YPG/SDF then negotiated with Russia and the Assad regime to hand over a number of villages west of Manbij to regime control in order to block Euphrates Shield from advancing on Manbij. This was announced on Thursday 3 March. As it was only with the aid of extensive coalition air support, including RAF air support, that the YPG/SDF had last August gained control of Manbij and the surrounding territory, this handover of villages now means that the UK appears to have helped facilitate the restoration of Assad regime control in the area. The local administration set up by the YPG/SDF, the Manbij Military Council (MMC), insists that the handover to the regime is limited to a buffer zone between Manbij and Euphrates Shield, and that the MMC is retaining control of Manbij itself. On Friday 3 March, the Russian military escorted a convoy to Manbij. The convoy was declared as humanitarian aid but also included “some armored equipment” according to a Pentagon spokesperson. On Saturday 4 March, as fighting between Euphrates Shield and the YPG/SDF continued, US special forces made an overt display of their presence in Manbij in order to support the MMC/SDF status quo. Special forces vehicles paraded flying the Stars and Stripes flag. Connecting regime and YPG/SDF territory has economic implications both for the Assad regime and for the residents and rulers of the YPG/SDF area. Abdul Karim Saroukhan, head of the PYD-led administration, told Reuters that the land corridor to the regime-controlled west marks an economic breakthrough for their autonomous region which has rich agricultural areas and oil fields but little manufacturing. Mr Saroukhan said the people of the region were particularly in need of medicines and construction materials. They in turn could sell surplus agricultural output to other parts of the country, though Saroukhan said poor rainfall meant there would be no wheat for sale this season. He also said surplus oil output from the region was looking for “exits, ways, crossings” to other parts of Syria, describing the area as the “oil well that supplied Syria for 65 years”. The region’s northern border is closed by Turkey because of PYD-PKK links. Its eastern border with the Kurdistan Region in Iraq has frequently been closed due to political rifts between the ruling parties on both sides of the border. The Assad regime retains pockets of control in the north east, in part of Hasakah city and in Qamishli. The regime’s control of the airport in Qamishli and its continued status as the recognised government gives it control over the flow of UN aid via airlift to the region. The prospect of increased trade gives the regime an opportunity to extend political influence in the PYD/YPG/SDF region, but also to recover some economic viability for regime controlled territories. 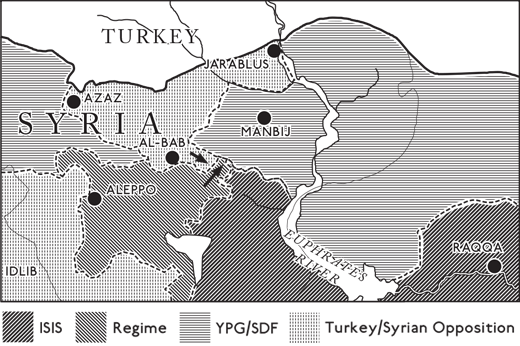 According to analyst Fabrice Balanche, historically exploitation of agricultural and energy resources in eastern Syria was essential to the Baath regime’s self-sufficient autocratic economy and to its political independence. The regime is now wholly dependent on foreign backers Iran and Russia. For Assad, regaining a measure of independence depends on regaining some measure of control of economic assets in the east. Since the Assad regime turned over administration of some Kurdish-majority areas to the PYD in July 2012, there has been controversy over whether the PYD should be regarded as an ally of the Assad regime. In her recent report for Chatham House, Rana Khalaf outlines the historical relationship between the Assad regime and the PYD. While Kurdish political activism in Syria was forbidden by the Assad regime, in the 1980s and 1990s Hafez al-Assad supported the PYD’s sister organisation the PKK on condition that it targeted the Turkish state and avoided domestic Syrian issues. This support included sanctuary for the PKK’s leader, Abdullah Öcalan, and helping the PKK establish military training camps. Despite Foreign Office unease, UK military policy was to support the US strategy for fighting ISIS in Syria, and the chosen partner on the ground for the US had since October 2015 been the YPG-led Syrian Democratic Forces (SDF). Therefore while Russian air support helped the YPG take territory from Syrian opposition forces in the northwest, and the YPG helped the Assad regime complete its siege of the Syrian opposition and the civilian population in eastern Aleppo city, RAF air support helped the YPG/SDF take territory from ISIS in the northeast, including Manbij. Why does the US support the YPG/SDF? The given reason is that the US sees the SDF as the most effective forces to fight ISIS in Syria, but likely more important is that cooperation with the YPG/SDF rather than the Syrian opposition forces of the Free Syrian Army allows the US Department of Defense to avoid coming into conflict with the Assad regime. US military involvement in Syria has two parts, one run covertly by the CIA and the other overtly by the Department of Defense. The CIA gives limited military support to a selection of Syrian opposition groups, intended to pressure but not overthrow the Syrian regime, and also to maintain US influence with those regional allies that back the Syrian opposition. The US Department of Defense leads the global coalition military campaign against ISIS in Iraq and Syria. The legal basis for coalition action in Syria is collective defence of the Republic of Iraq against ISIS, and the policy of the US Department of Defense in Syria is to work with partners on the ground who only fight ISIS and do not fight the Assad regime. Syrian opposition forces oppose the YPG as they see it as aligned with the Assad regime. With Turkey regarding the YPG as one and the same as the PKK and therefore as a direct security threat to Turkey, US policy in Syria has put relations with Turkey under strain. When US-led Coalition forces including the RAF gave air support to enable the YPG/SDF to take Manbij and the surrounding area in August, this went against a longstanding objection by Turkey to any YPG presence west of the Euphrates river. In November the YPG announced that it was withdrawing and handing over control to the Manbij Military Council, part of the SDF. However the Council is still regarded by Turkey and Syrian opposition forces as being under PYD/YPG control. Turkey continues to advocate a shift in US policy to back Syrian opposition groups to take territory from ISIS rather than the YPG/SDF, particularly in the campaign to take the city of Raqqa from ISIS. One counter argument from SDF advocates has framed the dispute as primarily one of ethnicity, and claimed that using Arab elements of the SDF to fight inside Raqqa should answer any concerns. The ongoing dispute in Manbij however suggests that the central issue isn’t so much ethnic identity as political dominance by the PYD and how that relates to Assad regime efforts to regain control over eastern Syria. Discussing her report, Rana Khalaf said that in her view even more important than the PYD’s exclusion of the Kurdish political opposition (including imprisonment of some opposition politicians) is its exclusion of civil society and its imprisonment of journalists. The PYD has gained legitimacy through effective provision of services, but in some areas local activists complained that the PYD maintained exclusive control of bakeries and housing, and prevented others from providing such services, thereby consolidating power and creating dependency. However this reputation has been undermined by accusations of serious human rights violations. In October 2015, Amnesty International reported on its investigation of the forced displacement of residents from ten villages and towns. For the UK, how does military support for the YPG/SDF fit with declared policy on Syria? Mr Cameron described that comprehensive strategy as working through diplomatic means for a transitional Syrian government while in the meantime relying on “the patchwork of Free Syrian Army troops in Syria” to fight ISIS. In the 15 months since the vote on action against ISIS in Syria, the diplomatic effort to achieve a political transition has failed. Military actions rather than diplomatic talks continue to shape outcomes. The Foreign Office has tried to gain support for actions that would reinforce diplomatic aims, in particular trying to gain support for airdrops of aid to areas besieged by the Assad regime. This effort was met with opposition from within international agencies (the World Food Programme and the ICRC), which depend on negotiations with the Assad regime to implement their programmes. Within UK government, the Foreign Office also appears to have lacked support from the Ministry of Defence. “The force that looks most likely capable of conducting the liberation of Raqqa remains the SDF. Are we confident in the SDF? Absolutely we are,” the British commander was quoted as saying. As seen in Manbij, the issue of which force takes Raqqa goes beyond short term utility. In the absence of diplomatic progress, military choices are shaping political outcomes, and unconditional support for the YPG/SDF risks undermining the overall UK strategy of achieving representative and inclusive government in Syria. There is now an urgent need to re-examine whether UK military policy is properly aligned with the UK’s political strategy to defeat terrorism and resolve the refugee crisis; to look for effective means to achieve legitimate inclusive government in areas liberated from ISIS; and to limit the Assad regime’s ability to regain direct or indirect control of territory in the absence of a political transition. Read more about What exactly is Hezbollah doing in Syria?